Happy Shark Week, aka the best week of the year! When it comes to sharks, we can all take a hint from the sharks’ catchphrase in Finding Nemo: Fish are friends! And that includes these be-toothed beauties. This year for Shark Week, we teamed up with Chicago’s prestigious Shedd Aquarium for their “Keep Sharks Swimming” initiative that aims to protect these living dinosaurs and to educate people on why they should be protected. The Shedd has been spreading a word in a way that speaks right to our creative hearts: through art! 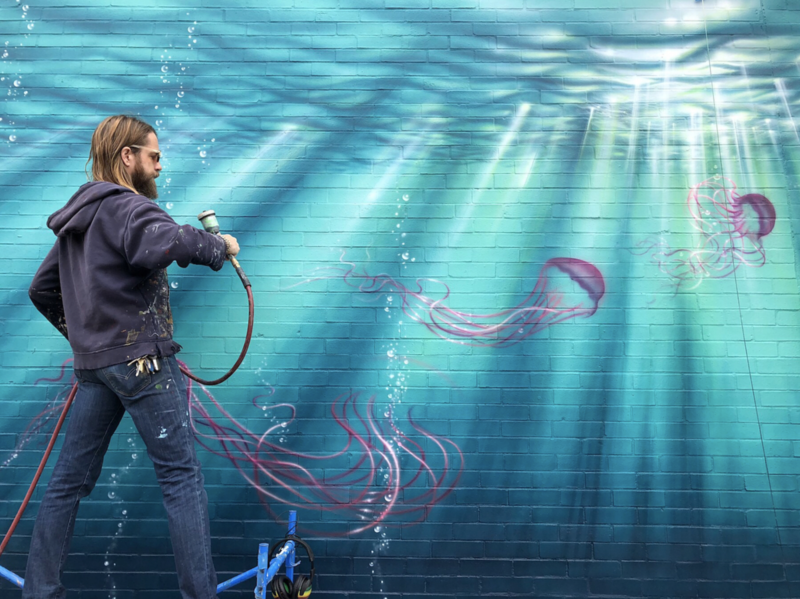 From commissioning ocean-themed murals all over Chicago to running a shark-themed design challenge and filling their Artist Shop with awesome work that benefits marine conservation to letting you dive with sharks right from your computer with their 360 videos, it’s never been easier to get obsessed with these creatures. Sharks are the coolest. And seeing as they’ve got a couple million years on us in terms of existence, they deserve to be protected. We talked to Steve Kessel – the Director of Marine Research at the Shedd – all about how Keep Sharks Swimming is helping and how you can help this Shark Week and beyond! To start things off: what’s your favorite shark and why! My favorite shark is the oceanic whitetip. I love their hydrodynamic form; they are pelagic sharks and are perfectly shaped for cruising in the open ocean. As a product of their habitat, spending long periods cruising around and not encountering any prey, they are very bold and decisive. I really like that about them; it commands a lot of respect. What’s something that people might not know about sharks or might not expect? Sharks are older than trees. Sharks originated around 450 million years ago, whereas trees first emerged around 370 million years ago. 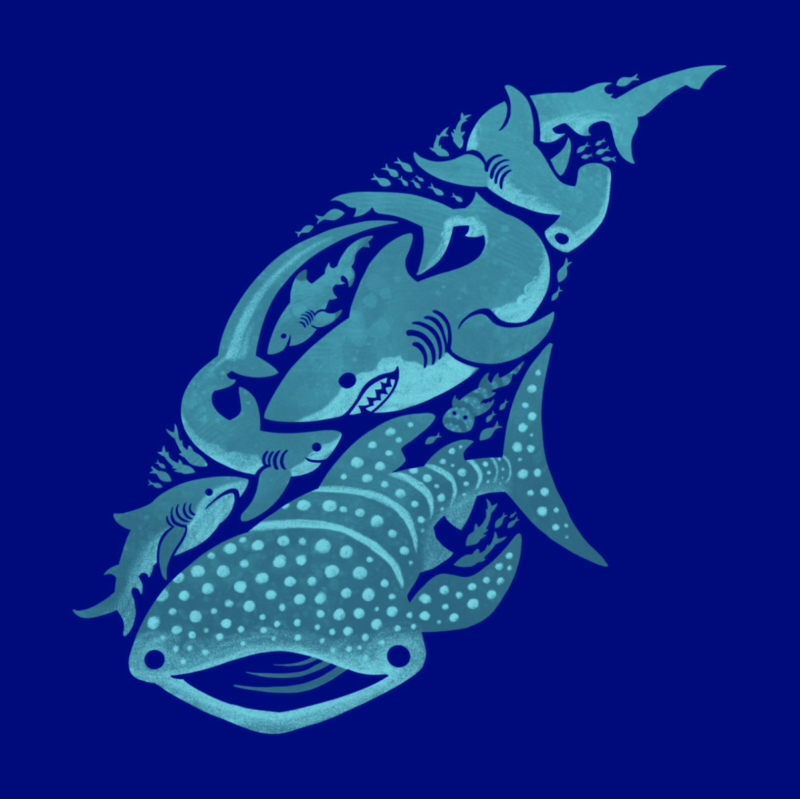 “Shark Shapes” by the Keep Sharks Swimming design challenge runner-up, Wayne Minnis. What is the biggest threat to sharks? Why do they need protecting? By far, the biggest threat to sharks globally is overfishing, both in targeted fisheries and as bycatch. They need to be protected, as many shark species are not set up for exploitation from a life history perspective. Many species invest a lot of energy in producing a smaller number of large young, which have a higher chance of survival. It also takes a lot of species many years to reach an age where they can reproduce, so when we deplete populations, it is difficult for them to recover. As humans are most accountable for these population declines, we are also most responsible for protecting them into the future. As humans are most accountable for these population declines, we are also most responsible for protecting them into the future. 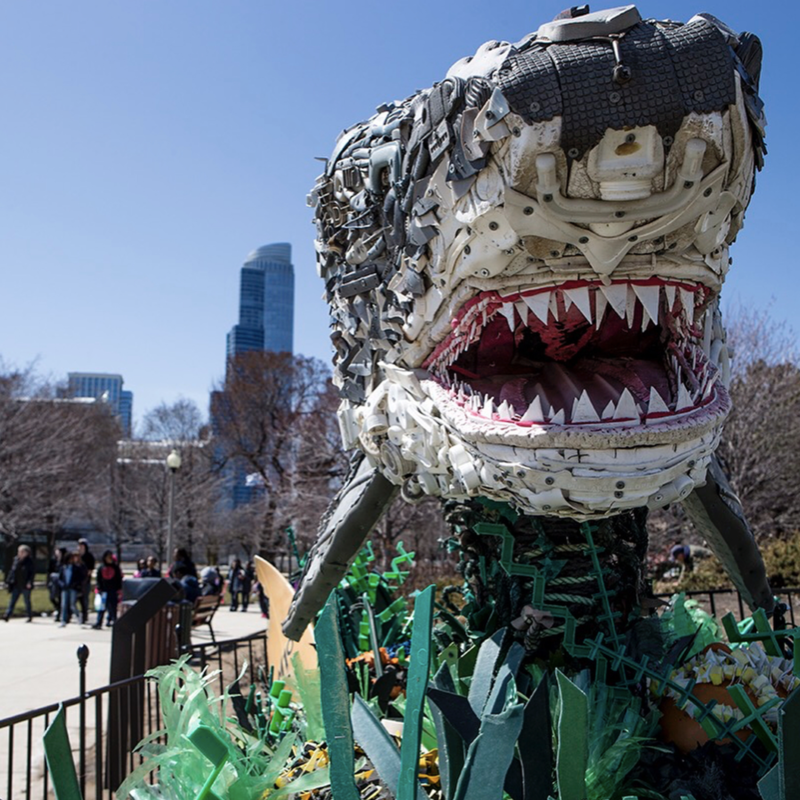 Between this project and their recycled art pieces, the Shedd has done a lot of art-related work lately! Has art been a good way to connect with people about conservation? In its many forms, art has the inherent ability to catch your eye, draw you in closer and spark curiosity for what the piece of art means. Shedd has tapped into eco-inspired art at the aquarium and elsewhere to engage people in conversations about protecting our waterways in ways we never have before and it’s proven to be quite moving for our guests. 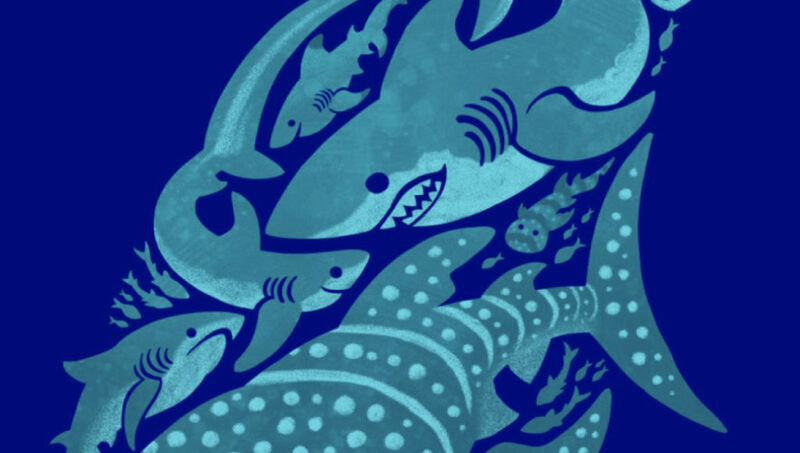 Whether the artwork is a larger-than-life shark made out of plastic that washed ashore on beaches or a drawing of a shark on a t-shirt, encouraging people to see sharks as beautiful animals through art can change the dialogue to be less about how scary sharks are and more about how they need to be saved. 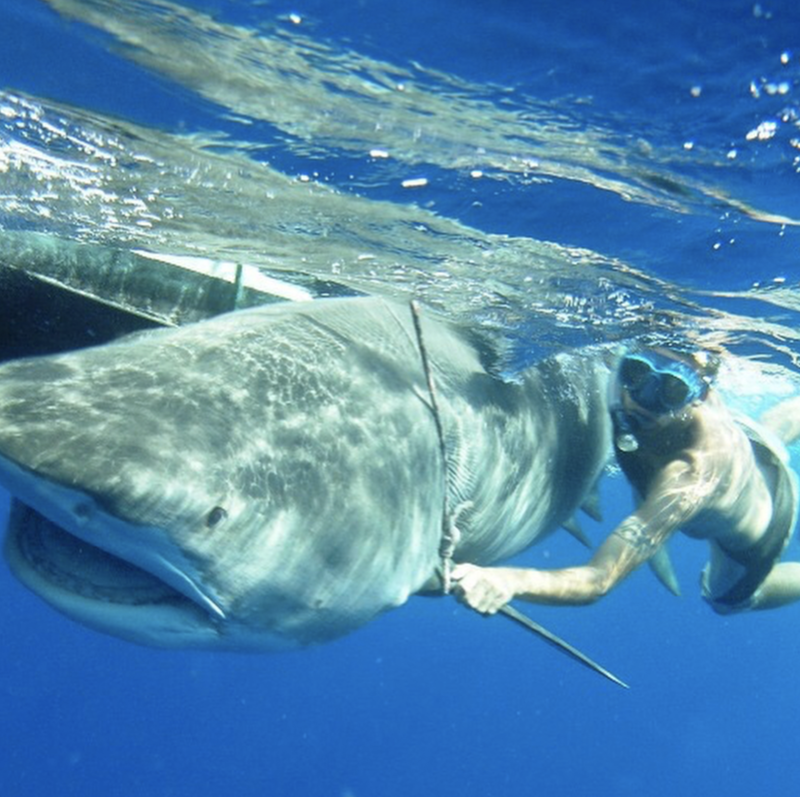 What can people expect to see from the Keep Sharks Swimming initiative? What are you most excited about? The Keep Sharks Swimming initiative provides people the opportunity to immerse themselves in the underwater world and virtually swim alongside sharks through 360 videos. The initiative also gives people the opportunity to speak up for sharks and express their support for shark protections. I am most excited that any person from anywhere around the world can experience a virtual dive with sharks and see how majestic these living dinosaurs really are as they swim overhead. Support cool art, support our world! 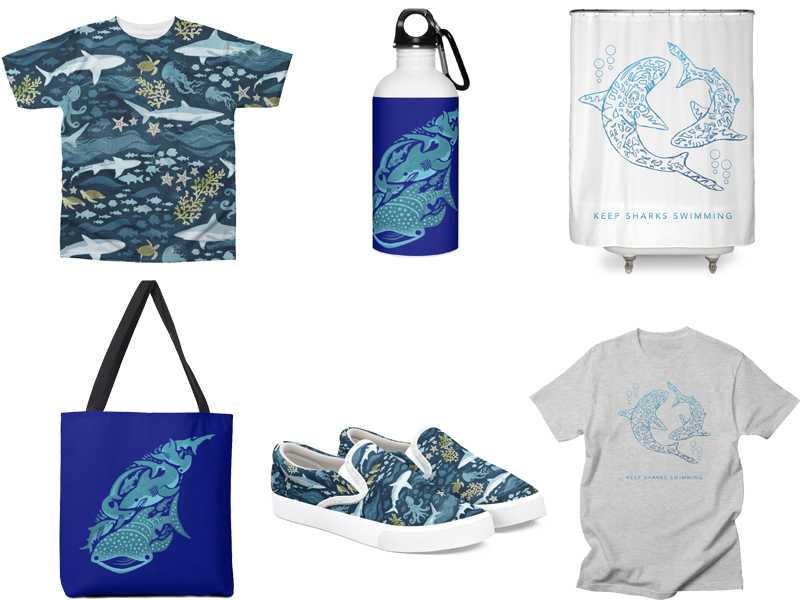 All proceeds from these designs and the products they’re on go towards Shedd Aquarium’s conservation efforts. 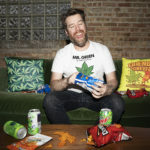 Top row: “Shark Ocean” on an all-over tee, “Shark Shapes” on a water bottle, and “Sharks Make the Ocean Go Around” on a shower curtain. 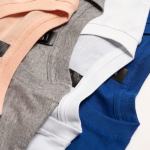 | Bottom row: “Shark Shapes” on a tote bag, “Shark Ocean” on a pair of Bucketfeet, and “Sharks Make the Ocean Go Around” on a tee. What’s the biggest misconception about sharks that people commonly have? There are many misconceptions about sharks and it is difficult to say which is the biggest. One I commonly hear is that “sharks can smell blood from three miles away” (or some large distance). They can sometimes if they are down current and the blood is in high enough concentration in the water column that it can be detected, but they don’t have some superpower where they can reach out and smell water that is miles away; their physical ability to smell is actually the same as many other fish species. What sharks DO have is very large brains – compared to other fish – that are geared toward their sensory systems. So, their ability to interpret the scents in the water and find the source of those scents is what’s exceptional. What kinds of advocacy efforts is the Shedd making in the Bahamas to protect sharks? 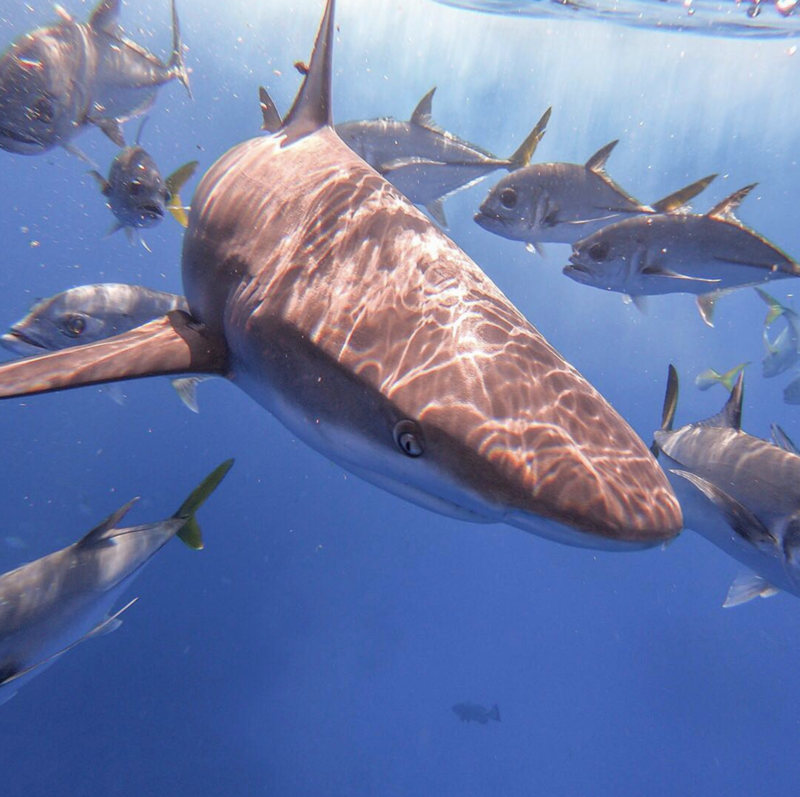 We are working with the Bahamas National Trust and Department of Marine Resources to highlight the great benefits of the Bahamas Shark Sanctuary for protecting and sustaining shark populations in the region. In 2011, The Bahamas government moved to designate its national waters a Shark Sanctuary. Since the designation, it is now illegal to harvest any shark species – commercially or recreationally – anywhere within the 630,000 square-kilometer safe haven of Bahamian waters. This was a real win for sharks on the global stage. This progressive approach to shark conservation can serve as an example to other nations in the Caribbean, but the success of this conservation measure needs to be assessed and monitored to ensure its long-term implementation. That’s where we come in; we will be assessing the sanctuary in our field research. 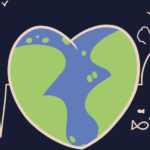 How can people help this Shark Week and beyond? How can artists help? As we celebrate Shark Week this year, we encourage everyone, including artists, to spread the word about why we need to keep sharks swimming for healthy oceans and to speak up for sharks. Through Shedd’s Keep Sharks Swimming initiative, people can send a letter of support to our partners in The Bahamas to thank them for protecting sharks in their waters. 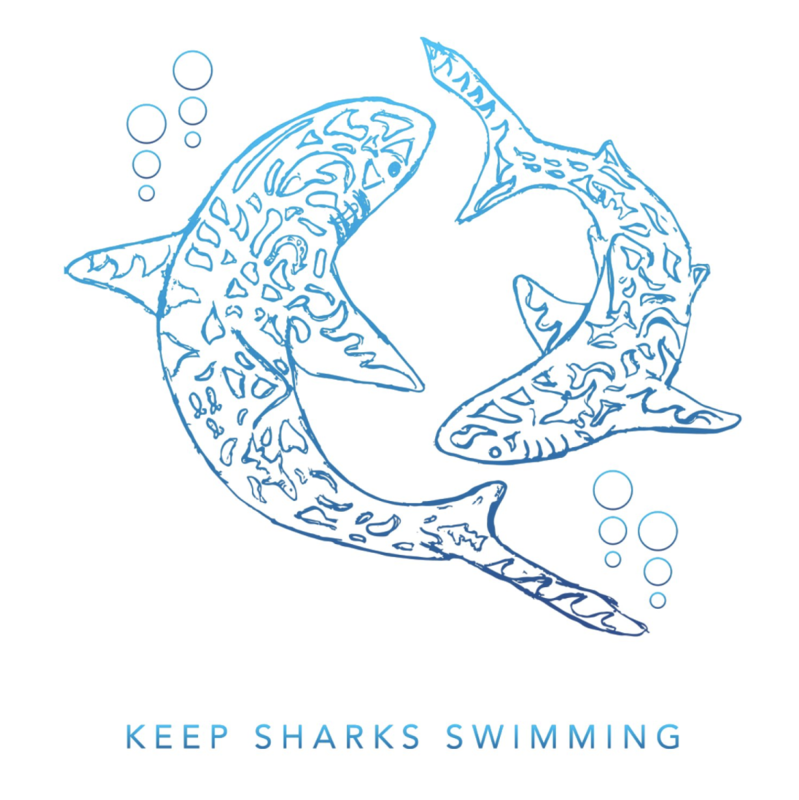 Additionally, by purchasing a shirt through Threadless, you can support our shark research program in The Bahamas. “Sharks Make the Ocean Go Around” by the Keep Sharks Swimming Design Challenge runner-up, Isaac Marta. Thank you so much! Anything else you’d like to share? Sharks have long been feared, but their role in our oceans is critical and we need to speak up for and celebrate sharks every day. You can celebrate with us at Shedd, where several shark species swim in the Wild Reef exhibit. You can even help feed them during a Shark Feeding Tour and see just how gentle certain species, like zebra sharks, really are. 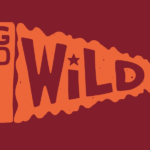 Posted in Blog, News, Spotlights and tagged charitable designs, good cause, Jaws, marine biology, marine conservation, ocean conservation, shark conservation, shark week, sharks, Shedd Aquarium. Bookmark the permalink.